Having lived in the middle east for 17 years of my childhood & teens, I only knew one season, and that was summer. No spring, no autumn (since palm trees are ever green) and winter just felt like what Scotland would call summer. So when I first moved to England, I just COULD. NOT. DEAL. with winter! I found the early afternoon sunsets and plummeting temperatures so depressing. But over the years I've learnt that in every season (figuratively and literally) there is something to be thankful for and a beauty, whether obvious or hidden, to be enjoyed. And the beauty of winter, was very much hidden for me. I had to dig deep. So deep. All the way down to the basement of my heart. For example, I have come to like the stillness of winter, where all the summer agendas and Christmas festivities are over. As an introvert, I cherish the quiet, me time. It's when I'm most creative. Plus, nothing beats coming home from a frosty walk (that sounds too romantic doesn't it? More like back home from work or the school run) and settling in with a nice hot cuppa or a warm bowl of comfort food. Let's just stop here for a min with the comfort food. Give me ALL the pies, crumbles, soups, stews and curries. Yas. Lord. So in honour of winter, I decided to make one of my favourite comfort foods; green lentils and coconut curry. (By the way, if you're looking for more recipe inspiration you can check out my recipes page here). This curry is comforting, warm, sweet, fragrant and if you like a bit of a kick, it can also be that for you. It's just great to have when the weather is miserable and you want something that makes you feel like all is well with the world, and whispers sweet nothings to your palate. However, what makes this recipe great, is that it caters perfectly for busy people. You can cook the green lentils and coconut curry once a week/fortnight/month (depending on how much you cook and how many people you're feeding), then store the lentils in containers and just freeze to devour at another time. This curry is also versatile as you can eat it as it is with some bread (gluten-free like buckwheat or millet bread), with brown rice or cauliflower rice if you're looking for a lighter option with more veg content. You can also have it with roast veg, potatoes or in a wrap if you drain the juices from it. Works really well as lunch or dinner. And best of all? Green lentils hardly cost anything to buy and are so nutritious! My kinda food. Are you a fan of green lentils? How do you like to have them? Add boiled water and lentils to saucepan and bring to the boil, then turn down the heat, add the turmeric and cover with a lid. Leave to simmer for 20 mins. Meanwhile chop the onion, ginger and garlic. In a separate frying pan add the coconut oil and when hot, add the onions and ginger. Sauté for around 5 mins or until soft. Next add the garlic, cumin, garam masala, ground coriander and cayenne pepper to the frying pan and allow to cook for half a minute or until the spices become aromatic, then add to the lentils. Next, stir in the tomato puree and pour the coconut milk in with the onions, garlic, ginger and spices. Give it a good stir and allow it to simmer for 2-3 minutes to allow the coconut milk to take on the flavour of the spices. Drain any remaining water from the lentils , then add the coconut milk to the lentils. Add the spinach and turn down the heat and cover with a lid. Leave to simmer for a few minutes for the flavours to absorb. Finally, turn off the heat, add the chopped coriander and stir. Add salt and pepper to taste. Garnish with coriander leaves and chilli flakes. If you don't like your food spicy you can leave out the cayenne pepper and chilli flakes. You can add more or less of the tamari to taste, but less salt is better! If you have picky little eaters you may want to chop the spinach and coriander finely. 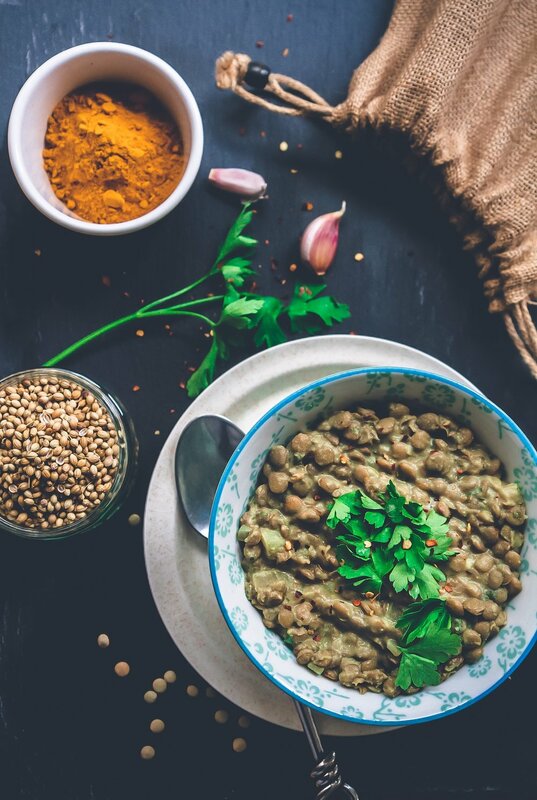 Green lentils - are an excellent plant-based protein, rich in minerals and fibre which improve digestion and stabilise blood sugar levels. They also lower cholesterol, prevent heart disease, improve immunity and aid weight loss. Onions - high in antioxidants which help prevent cancer and protect against heart disease by reducing the risk of blood clot formation. They also improve blood circulation and blood pressure levels. Beneficial for arthritis prevention/arthritis sufferers due to anti-inflammatory properties. Garlic - an incredible 'superfood' linked with preventing cancer, heart disease, strokes and a multitude of infections. It also helps improve dementia symptoms, and controls blood pressure. Ginger - a highly potent antioxidant and an anti-inflammatory plant, aids with malabsorption, constipation, nausea and digestion. Just like garlic and onions it helps prevent heart disease and strokes. In addition, it aids weight loss and fights cancer. Coconut - coconuts contain lauric acid which have antibacterial & antiviral properties, whereas capric acid which is also found in coconuts, improves the immune system and protects against alcohol damage to the liver. Turmeric - a powerful healing food that contains a powerful anti-inflammatory compound called curcumin that provides pain relief, improves gut health, supports growth of healthy bacteria in the gut, lowers blood sugar, reverses insulin, reduces tumours and kills cancer cells. Spinach - rich in antioxidants and a potent anti-inflammatory decreasing the risk of heart disease, diabetes, cancer and obesity. It is also a rich source of vitamins K & A.
Cayenne pepper - a metabolism booster that aids weight loss, relieves migraines, joint and nerve pain and improves digestion. Tamari - a gluten-free alternative to soy sauce which has almost 50% more protein than it's alternative, and 15% more minerals like iron and manganese.